At some point, maybe even sooner than later, you must get in touch with the creative side of what your student is doing and learning. It’s very important to “tune in” to just what may creatively drive that particular person, and where their tendencies go when it comes to their ideas. I find that there are many times I love to jam with them to help bring this out, or as is what happens in many cases, simply jam along with them, because that’s all they want to do! Some of my students, once they’ve learned a nice realm of “basics” just want to come into the lesson literally roaring with ideas! This is fine and okay with me, but I find that I must, as a teacher, actually adjust my approach to accommodate what it is they’re going after. When you are doing this kind of thing, and have this kind of interaction between student and teacher, you’re bound to get caught up in the creative process as well. Many times, this leads to collaborative song writing, which I also believe is an important thing to get involved in teaching, and this has happened with many of my students, right through the recording process. 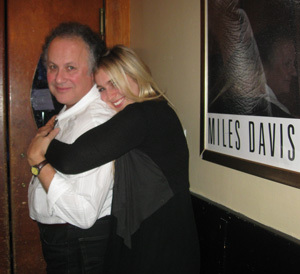 Even when I was teaching a creative giant and luminary such as Paul Simon, my hour-long lessons would turn into literally 3-hour song writing session, in which I’d help him write his songs. As talented a writer as he is, he was always telling me he was “stuck” for ideas, and sometimes my particular vantage point of his writing would spawn whole new creative concepts and ideas for him, often taking his songs in whole new directions! Of course, with a student such as Paul Simon, I didn’t really need to “harness” his creativity…there was plenty of that for him to tap into, but with many of my younger students it’s really a whole new ballgame for them, and it’s very important to always point them in the right direction. There’s usually a time when there’s a kind of “chaos” that first exists within their ideas and their creative playing, and eventually, with the right input from me, and some other “ingredients” thrown into the pot, I can sometimes see a much more interesting structure coming out of the previous slightly “haphazard” approach they may have had. This is so rewarding for me, for as a self-taught guitarist, it was always about the creativity first, and then the necessary technique and fret board knowledge would start to be acquired, and eventually it’s what would take over. This would always lead to a better and firmer grip on the handle of just what was available to me as a player/writer/improviser, and this is certainly what I love to help develop in my students as well. So I guess you can take good stuff away with you from this Blog, regardless which side of the coin you are on…the teaching side or the student side. Doesn’t really matter…the students always ends up helping to teach the teacher! Always Give It All You've Got! I know it sounds like a real music-biz kind of “cliché” to say this about “giving it all you’ve got”, but it can mean much more than just the surface implies. I have always found that I basically can’t help but give the music my “all”, especially when performing live, and also being in the studio. This also means not only really putting out a great deal of energy, but also using a great deal of taste and restraint as part of this process. After all, music is a true art form, and the dynamics and sheer range of what you can show others must take in a very large and diverse scope. The more you learn and experience as a player, the more you can “put out” or “hold back” as a performer and as a studio player. I do believe that not only for the audience, but we, ourselves deserve to give any performance our best shot. As we get older, wiser and more experienced, we all become a bit more restrained and selective in our performance choices. I guess we can call it “seasoning” as an artist, and putting out our best foot forward is always worth it when it comes to learning more and more as a guitarist, an artist and as a performer. Being self-taught, the performing and recording experiences always seemed to raise the level of my learning. I mean, when I sometimes listen back to shows I have performed, I often must say something like “where did that phrase come from? !” or “that was something I never did before, and I have no idea how it happened!” Well, the truth is that the more that we are in that “higher state” that is required for true artistic performing, the more we are playing “outside of ourselves.” These are the moments when we really hit that stride we are looking for and the soul and spirit of the guitarist is flying, and the expression we are getting across is soaring it’s way right into the hearts of the listeners! So, always be sure to give it your all. You will always be the greatest recipient of the benefits of doing this, and you’ll be amazed at how much you will learn as a musician and as a person in the process! Good luck! It’s always been a critical thing for anyone who wants to really ride a wave of success in this business to have a good manager or agent. Unfortunately, that’s an awfully hard person to come by, and finding one you can really trust, or who really believes in you can be a difficult and frustrating process. After all, when we have an agent or manager, (it’s better to have both, by the way!) you need to have someone who you know really can represent the “real you”, and who always has your best interest at heart. Sometimes there are managers who are so consumed with their own ego and how they picture you that they can actually “blow” many great opportunities that may present themselves without you ever even knowing there was such a chance offered to you. The best managers I’ve ever seen, without question, are the ones who deeply love and understand their artist. This more often than not means that they came to the managerial side of things quite by accident, and that it came more as a result of them trying to fill a need they saw for their musical friend they had so much belief in. They may not yet know “the ropes” as far as the business is concerned, but what they don’t know will certainly be soon changed into knowledge, and their lack of initial knowledge will certainly be made up for my their belief in, ad love for, their artist and his/her music! If this occurs at an early age for the both of you, it’s a great chance for you both to “grow” together into the music business, and all the crazy experiences that will inevitably follow. Unfortunately, I have seen many manager/artist relationships fall by the wayside when things just seemed to really be “taking off” for the performer. Clashes of personality and ego can certainly flare up and occur, not to mention just the sheer volume of agents and managers who end up getting too greedy, and who eventually steal from the artist. I have seen this on many very low and very high levels, sometimes involving literally millions of dollars that were taken without even being noticed for a long time! As the income grows, so does the temptation for someone who has a thieving heart, and sometimes it gets the best of them. In the long run, they all get caught, yet it just amazes me how many times this continues to happen. We of course, hear about the highest profile cases, the ones involving the biggest stars and the most money, but it also happens to thousands of artists on a much lower scale of income, but who get ripped off nonetheless. So most of all, you must have an agent or manager you can really trust with not only representing you, but also in handling your finances, and making sure you are treated fairly by everyone. They have to be at the frontline, taking the shots for you, so you don’t have to be exposed to the uglier parts of the business, and so you can stay concentrating on the most important thing of all...your music! Remembering that Moment of Clarity! A lot of people always ask me about when it was that I really felt I had become a great guitarist, or even more precisely, when are they going to become great guitarists, and I always end up recalling a moment of great “clarity”, when I actually realized that the guitar and I were literally “at one” with each other. This is no joke, and it really did one day, at a very specific moment, suddenly “hit” me that I was pretty much saying whatever I felt or heard right through the guitar, without any thought process seemingly involved! This was quite a remarkable time, as I had already been playing about 8 or 9 years, was 19 years old approximately, and was just sitting around in my folk’s living room, paying my heart out in a very unassuming and private way. All of a sudden, in the blink of an eye, I was realizing that the guitar had become a complete extension of me and my feelings, and that even though I still had countless things to learn, I was already truly “speaking” through the instrument. This is a very major moment in the lifetime of any musician or artist of any kind, and it takes a great deal of pursuit and striving for this in order for it to happen. Obviously, it is easier for some more than others, but I believe we really all “have it” in ourselves to make these kinds of feelings and moments of “enlightenment” occur. And why not? After all, we are all human, ad all possess this amazing ability to be creative in some walk of artistic life. When people tell me they are “tone deaf”, or have no ear, I just ignore that, and start to tell them my stories of those special moments when certain musical and sonic revelations have come to me. Another critical thing is that acquiring of perfect “relative pitch”. This sound “relationship” we need to recognize is so critical to our success as musicians that I’d put it up there as truly #1. After all, if we can’t understand what we’ve just heard or played, or what we are wanting to play, then we are just “spinning” our wheels when it comes to finding the notes we “think” we are hearing. Instead, we must be able to literally predict what it is we are about to play, as well as thinking ahead a few musical moves, just like a chess master, when they are strategizing their chess game. So, be sure to keep trying to achieve that moment of “clarity” and “realization” when it comes to your guitar playing……and I can tell you this…it’ll only happen if you play all the time! So keep it up, and never give it up; it shall happen!! Best of luck! As guitarists, we are certainly obsessed with our tone these days. It seems like you can’t get into any discussion or other dialog about the instrument without getting heavily into the “tone” issue. The tone you produce comes from so many places that there really is no one place we should overly obsess about. The first thing to realize is that the main source of your tone is what simply comes from your very own fingers! How that translates through the strings, the fretboard, the guitar, and finally the amp is what really makes up the whole “tonal” spectrum for you, and what eventually and truly becomes “your sound.” Obviously, what I look for most is simply how truly all of those elements translate by the time it reaches the amp, and your ears. What you hear should be what you are feeling and most of all what you are wanting to hear! All the links in the chain can have an effect on your eventual sound, and no aspect should be overlooked. Everything, right down to even the pick you use can have a changing effect on your sound, and before getting into effects and other “stomp boxes” you first must make sure you are happy with the actual sound you are making. The natural approach at first is best, meaning what you sound like basically with your guitar plugged into the amp with just a cord between you. This will tell you what your pickups are doing for or against you, and will help you determine just how “real” what you’re getting truly is. Many different types of pickups, in various configurations, are available to the guitarist these days, and whether you are playing humbuckers or single-coil pickups will have an immediate effect upon your sound right off the bat. It’s almost as if these two kinds of pickups also represent two “points of view” when it comes to your overall tone. In the end, it’s your call, but you should definitely try both to see just how they ‘speak” for you. Then there are other choices such as whether you’re playing a maple fingerboard, or a rosewood or ebony board. These also have an altering effect on your sound, as they are different woods, with varying densities. One can even tell the difference if you play acoustically at first, and feel the vibrations that particular finger board is giving you back through your fingers. The guitar body itself, the density, the kind of wood, etc. all play into the sound as well. I tend to like lighter weight guitars that have a good resonance that you can actually “feel”, whether you are plugged in or not. I have actually even bought some electric guitars just by checking them out acoustically, even before playing them amplified! So, never forget that the tone you want really starts with you and your fingers, and everything after that should do the job of reproducing how you want it to sound. If you’re not quite sure of what that sound is yet, feel free to experiment and to see what works best for you…only after that, can you even begin to start to add other sound-altering devices, such as effects pedals, and the like. So have fun on your tonal “quests”, because the search is really half the fun! After that, it’s all in the fingers, and all totally rewarding! ANOTHER GREAT GIG AT THE IRIDIUM! The day after Christmas, we had a wonderful time at the famed Iridium Club in NYC, where the great Les Paul used to always “hold court” on Monday nights for decades! 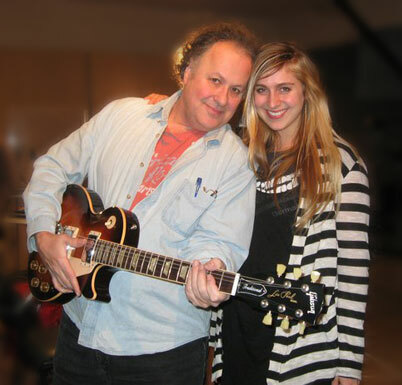 Lexie and I played with the Les Paul Trio, whom we also just did the tribute album with, and I got to play about 8 songs. It’s always a real interesting blend when me and the wonderful Lou Pallo (who now has his own Les Paul signature model!) take our respective styles and make them work together. I always find it quite a challenge to play with such “straight Jazz” players, melding my own blend of Country and Blues-tinged Jazz with them. It does always work out, and this time, despite my nervousness and apprehension, it also worked out especially well! We had a very responsive totally “sold out” crowd, and I got to see many great old friends and acquaintances as well! The thing that blew me away so much was also how I could really at times “rock out” and really raise my volume level, in spite of playing with a Jazz trio, without any drums. 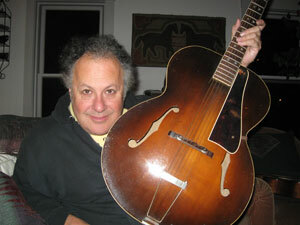 Lou Pallo has such a strong right hand and comping style, that he really provides such a strong rhythm. It just meant that sometimes, I had to actually, and literally stop my playing, so I could hear the “chuck-chucks” he was comping, so I could once again be on the beat! That caused a few harrowing moments for sure, but in the end was no big deal! Also and equally amazing was how I could just literally “call out” tunes, some of which they didn’t even really know that well, and we were all still able to “fall in” together, and make it a valid and refreshing performance! At times, I had to actually call out the changes to them, but once we got our “musician’s language” together, all the communication seemed to flow smoothly. It also helps when you’re there with a crowd that expects “spontaneity”, and literally doesn’t know what will happen next. This was the wonderful tradition that les Paul created there, with his seemingly endless Monday night jams and performances. You really can’t help but feel his wonderful presence there, looking down on all of us, his “children”, as we continue his great tradition in a place that is truly “guitar mecca!” I get to play there again at the end of Feb. with my own band, and I can’t wait to return! If you can ever make it to this incredible club, you’d really have a special experience to say the least! Nothing can really compare with the feeling of when cultures and people from distant parts of the globe actually can come together over their mutual love and appreciation of music. I have had many experiences like this over the years, and the other day, had an especially incredible one! I apparently have some great fans over in Europe, where I have of course, played, but only sparsely, and in many places, a long time ago. This friend and fan came all the way from Spain to meet me and to present me with a guitar as a gift. I was so blown away as to almost be speechless! He said to me that he had been learning from my videos since he was 10 years old, and that now even his 10 year-old child was now learning from them as well! He also expressed interest in bringing me over to Europe to do some touring, and of course, I am extremely excited about this prospect! The greatest thing though, was that we could simply sit down, having never even met before, and simply “rip” into a number of songs I have been playing for years, and he knew every change, every lick too! What an amazing experience to have such a fan come and be so wonderful and generous, and on top of it all to have a musical exchange like that! Of course, it brought me back to some “old” days, when I did this all over the world, and all over America, as well. That wonderful comradery that can occur between musicians, even ones who’ve never met, is truly awe-inspiring, and should also be very musically stimulating for all those involved. It’s almost as if the experience is actually heightened by the “international” nature of what is going on, and the ear and the hands are that more “vigilant” about what they are doing! I certainly know that it can occur also when a band from another culture gets together and learns my stuff so they can back me up when I come to their country. Jeez, sometimes they’re even better than my own band, and are certainly taking the whole assignment a lot more seriously than perhaps players who play with me on a regular basis! Of course, this teaches all kinds of lessons in life and music as well, and can be such a learning experience for anyone who ever goes through it! So good luck, and I hope you one day get to experience these wonderful musical “culture-combining” moments! We all know that there seems to be a never-ending array of “attitudes”, both positive and negative, in the world of music, and of course, the world of the guitar. In your formative years, any kind of criticism can be truly taken to heart for many reasons, but the way it can affect you is especially important. I can remember in my early days, how there often seemed to be a barrage of criticism, often leveled at me from people who really turned out to be nothing but very jealous of my abilities, especially for a guitarist so young. This being good at a young age can sometimes be a bit of a “curse” since you are so vulnerable and impressionable as well. This is a time when many can take advantage of you, as I was very taken advantage of when I was younger, and the fact that you really want to impress everybody can sometimes work against you, as you actually and inadvertently leave yourself wide open to all kinds of attacks and criticism. On the other hand, this period in your life and career can also be so positive, and here’s to those who always find a way to either praise you, or to at least give you truly “constructive” criticism. I know that in my own time, I have never forgotten good, constructive criticism when it was given to me, and it somehow has really always been something I’ve gone to in my memory for help and guidance. In my later and current years, I have truly enjoyed being a mentor and helper to many gifted and many not-so gifted players. This ability to complement and to properly criticize students and fellow players is a well-honed skill that should never be taken lightly. My responsibility as a mentor and leader of others is certainly something I take very seriously, and I always enjoy and embrace the wonderful honor it really is to work with these people. I have always found that I’ve learned a great deal from folks who mishandled me in the past, to be sure that I never mishandle anyone now. This is especially important when recording, since that process can be very tedious, and can leave large “marks” on someone if handled wrongly. The act of “being under the microscope” in the studio tends to magnify what you do, and the sheer intensity of the atmosphere of recording and being under scrutiny can heighten all egos and emotions involved, so one must take extra care to be only “constructive” when criticizing anyone. After all, it is what translates onto tape that matters most in a case like this, and you don’t want unhappy musicians to be making unhappy sounds! So keep all this in mind as you move forward, and be good to everyone, even if it means having to be “constructively critical” in the process! I have always been considered to be rather “nocturnal” in my habits, and I suppose this is the case with many musicians. In my case, I didn’t really become nocturnal as the result of being a musician, because it was quite apparent, even as a child, that I simply loved to stay up late at night, and always have had a hard time getting out of bed in the morning! I suppose this means that I was somehow “custom made” to be a musician in a way, and also to be a creative person who enjoys “burning the midnight oil” for creative ideas. I’ve always somehow found the later times at night to be more of a peaceful time for me to get my work done, not to mention that for me, it’s just a great time to play, practice, and to be inspired for new ideas. On the other hand, I can recall doing many great all-night, or late-night recording sessions back in the early days, but I find that now that I’m older, I prefer to record during normal daytime “work” hours. After all, once you’re in a recording studio, which is usually closed off from the outside, one tends to lose track of the hours that are passing by, and your own internal clock seems to “recalculate” itself towards the time at hand, as opposed to what’s going on in the outside world. I have always actually loved and embraced working towards a deadline, which has always helped me to focus when it came to really having to “knuckle down” on projects such as books and my own albums. I find that I need that kind of slight time pressure to help me see the “finish line” with any given project I may be doing. Most recording studio situations are the kind that have to be done a little at a time anyway, so as not to end up with “tired ears”, where you basically cannot correctly make decisions when it comes to sound, and you get to a point where you’re simply “too inside” the project to hear it objectively. One needs to be able to “step back” and also take a breather from literally hearing too much and also to just give your ears a rest! But if you’re working on your own, and really need to compose, practice or just even think creatively, many of you as musicians will have to get used to using the late night hours becoming your best friend. It’s not just a coincidence that many players enjoy this time of night to be creative, and it certainly applies to many art forms as well, whether you’re a writer, a painter or whatever else you enjoy doing creatively! So, if you’re already a “creature of the night” you’re ahead of the game, but if you have a hard time finding time to yourself as a musician, I certainly suggest that you begin to love “burning the midnight oil!” Best of creative luck to you all! Finishing Touches on the Albums! Over the last several months, whenever I’ve had some free time, I’ve been working on two very personal album projects. One is my new album, entitled ‘All Tricked Out”, and my daughter Lexie Roth’s new album, which as of yet has no name, but most likely will simply be called “Lexie Roth.” It’s been quite a fun ride doing these two projects, and since Lex had done her first album, One Long Blink, back 6 years ago, very much still under my tutelage and guidance, she decided this time to go at it more independently, making the tracks with her own choice of players, in our house, and then doing the overdubs later in a more professional studio, with me helping her out. I added a little sweetening guitar, and some other very subtle touches, but this album, consisting of all her own songs, is truly independent and personal in nature for her. It’s a wonderful testament to how much she has grown as a writer and singer over these last few years, and it speaks very strongly for her. She already has one song from it called “Call You My Hon” that is featured in a new independent film starring Karen Black, entitled Maria, my Love. That should really help get some additional interest in her album, plus the fact that she sings “Via Con Dios” on the Les Paul Tribute album we did this year! I feel that all the final touches are done on my album as well, and one thing I noticed in the process is how we can get so “married” to the early mixes of album tracks that we actually start to “live” with things and subtleties we simply choose to ignore, or think we can’t do anything about! It’s really a funny phenomenon, for as I can recall with many of my previous projects, I can now hear so many things I chose to live with and accept, when they could’ve easily been improved. This time, I was far more cogent of noticing those very things that in a subtle way, I chose to ignore, even though subliminally they were eating away at me. Finally, when you’re in the last stages of really looking at the album “under the microscope” these things finally hit you, and you realize you’ve been far too willing to compromise and to accept a lesser level of performance! It’s quite a revelation when this does happen, and I must admit its very “freeing” to know you can do so much these “digital days” to improve a recording with very little effort. Not that I overly rely on technology for my sound, but let’s face it, the recording and mixing process is so streamlined compared to the old days it’s not even comparable! So hopefully in the coming months I can give you some audible “tidbits” of these new albums we are so proud of, and I’d love to get the reactions of you, my fans and friends!